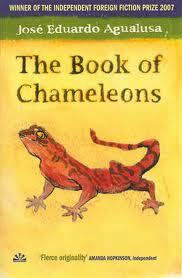 The Book of Chameleons made me smile. There was just something about the way it was written that really made me smile. It's a surprisingly quick read, and a short(ish) novel (I wonder, could it be considered a novella?). The all-seeing narrator of The Book of Chameleons, Eulalio, lives in the mansion of Felix Ventura, an albino man living in Luanda, Angola. Felix's job is to create new lives for people by fabricating their past - creating a newer and better false histories for them. He doesn't just do this for anyone but for those with money - "businessmen, ministers, landowners, diamond smugglers, generals". Eulalio observes everything that goes on in the house, but also has his own past and dreams, which we get to read. Felix goes about his life, forging pasts and enjoying sunsets with his friend Eulalio until three people come into his life - a photojournalist who is desperate not only for a new past, but a completely different identity, a secret agent, who pretends to be crazy and lives underground, and a beautiful female photographer. With the entry of these three people in Felix's life we find out that there is no such thing as coincidence and no matter how much you try (or should I say how much you pay) to change your past, sometimes you just can't. The Book of Chameleons was a book about identities and memories, truth and lies, past and future. It was a thoroughly enjoyable read. Now I can officially say I've read a book from Lusophone Africa. Sounds like a great book, and short-ish is an additional perk! @ Pam - It was really fun to read. I've heard about My Father's Wives so do let me know if it's good. I've got another of his - Creole - sitting on my shelf waiting to be read. @ Efioanwan - short-ish is a great additional perk. You can honestly read it in a few hours. The Book of Chameleons sounds great and will also bring me smile as I read your review. Thanks!